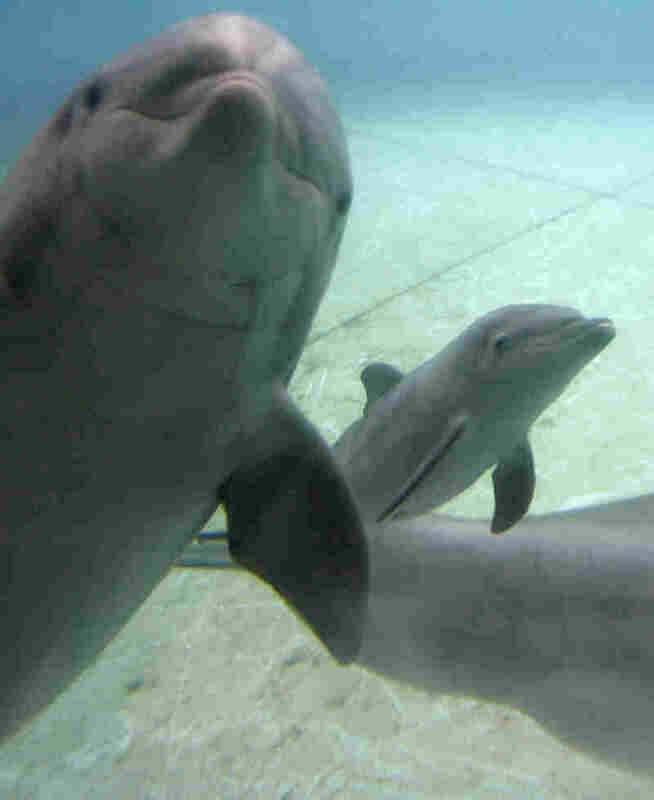 Baltimore's National Aquarium Announces Plans For North America's First Dolphin Sanctuary : The Two-Way The aquarium says its decision is driven by new understanding of the needs of these highly intelligent mammals. It says a seawater habitat will better allow the dolphins to form social groups. 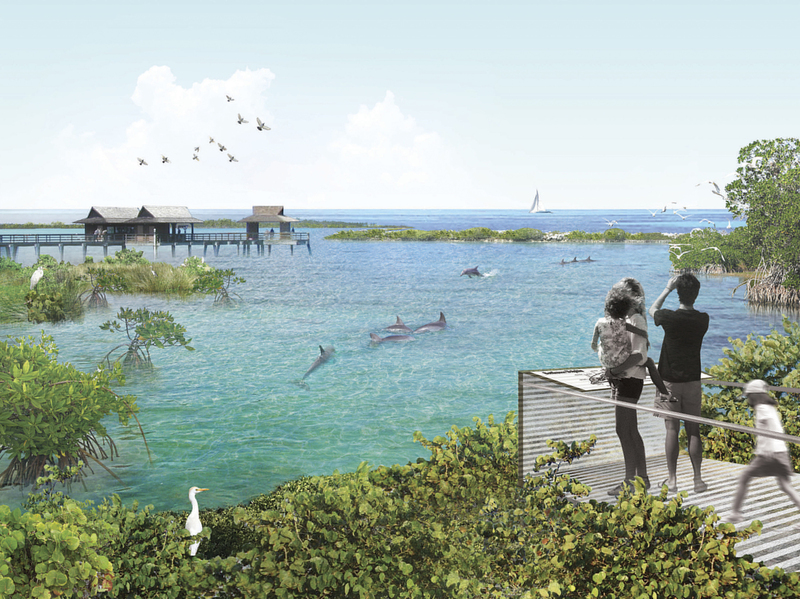 An artistic rendering of the seaside dolphin sanctuary proposed by the National Aquarium in Baltimore. The aquarium is scouting locations in Florida and the Caribbean. Baltimore's National Aquarium has announced plans to create an oceanside dolphin sanctuary, billed as the first of its kind for the marine mammals in North America. The aquarium says it hopes to move its colony of eight Atlantic bottlenose dolphins to an outdoor facility with natural seawater by 2020. A team is currently scouting locations in Florida and the Caribbean for the habitat, which they are calling "a new option for human care of dolphins." The decision is driven by new understanding of the "unique welfare needs of these intelligent animals," as the aquarium's chief executive officer, John Racanelli, writes in an op-ed in the Baltimore Sun. "Emerging science and consultation with experts have convinced us that dolphins do indeed thrive when they can form social groups, have opportunities to express natural behaviors and live in a habitat as similar as possible to that for which nature so superbly designed them," Racanelli writes. Animal rights activists have staged protests over the dolphins' captivity for years, The New York Times reports. "The aquarium stopped offering shows in which the dolphins performed a few years ago, but tourists and visitors can still watch them in captivity," according to the Times. The aquarium attracts some 1.3 million tourists annually, the Sun reports. Tuesday's announcement comes after five years of debate about the best option for the animals. "We didn't make this decision because it was the cheapest or easiest option — it was neither — and it wasn't a decision we could have made quickly or without thoughtful consideration," Racanelli writes. "They have never before felt the rain on their dorsal fins, chased a mullet along a mangrove shore or teased a startled crab. They will need to learn how to be ocean-dwelling dolphins, in a place with its own set of risks like pollution, noise, jellyfish and red tides, and we will help them build those skills." The aquarium envisions a new habitat with a vegetated shoreline featuring mangroves and sea grapes, with "pools that can be customized to meet individual dolphin needs." It's unclear what kind of interaction guests to the habitat will be able to have with the dolphins, though the aquarium says they will "continue to offer our guests a dynamic and engaging experience." Racanelli says the American public has grown "increasingly uneasy" with the idea of keeping dolphins and whales in captivity, saying films such as Free Willy contributed to the trend. He adds: "We, too, have evolved — from an entertaining sea life attraction to a nonprofit aquatic conservation organization." In recent months, SeaWorld said it would stop captive breeding of killer whales and the Ringling Bros. and Barnum & Bailey circus stopped using elephants in its shows.